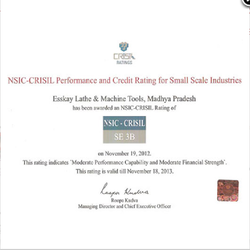 India's Leading ISO 9001:2008 certified Machine Tools Company Rated (NSIC-CRISIL) SE 3B. 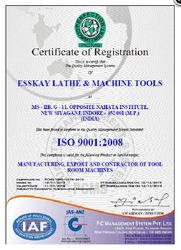 Since our establishment in the year 2006, we, “Esskay Lathe & Machine Tools", Indore, have been involved in the field of manufacturing, exporting and supplying an outstanding range of Tool Room Machines. We use only excellent grade components and spare parts to design our range of machines. Used in a variety of industrial applications, our range is acknowledged due to its robust construction, high energy efficiency, easy installation, low maintenance and noise free operation. It can be availed from us at competitive prices. Our modern infrastructure facilities include core laying and wire twisting machines, which are essential for meeting the bulk orders of the customers. Furthermore, our team of quality controllers conducts rigorous tests on the product range so as to ensure their durability, high performance and resistance to corrosion. Reliable and durable, the range developed by us is dispatched after inspection of intricate details, so that the best reaches at our client's sites. 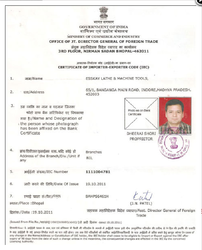 Apart from this, we have mustered a wide client base that is based in Middle East, South Asia and Gulf countries. Our mentor, ‘Mr. Dheeraj Shori’ has enabled us to deliver the desired needs and specifications of the clients. His sharp business acumen and strong leadership abilities have ensured that the workers in the organization maintain close coordination with each other. We export our product in East Asia, Middle East, South/West Europe, South East Asia, India Subcontinent, Caribbean, East Middle Africa, South West Africa, North Africa. 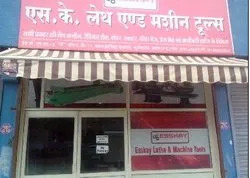 Manufacturing & Trading & Exports of Industrial Machines and Grinders. 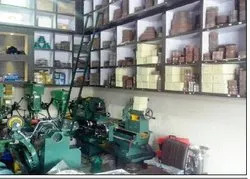 Our experienced team of quality controllers constantly checks the different stages of production, from the time raw material is procured till we deliver the final product to the customers. In addition to this, regularly conduct several training sessions inside our premises, to keep the team abreast with the changing market scenario. In order to achieve the maximum client satisfaction, we deliver only superior quality products to our customers across the globe. We have expanded our network to domestic and international markets and are in the process of continuously expanding our client base. Besides, we source only flawless material from our trusted vendor base, which helps us channelize our endeavors towards offering a superior quality range to the clients. Furthermore, we have always maintained amicable relations with our clients situated in Middle East, South Asia & Gulf countries. Owing to our high quality products, timely delivery, competitive prices and innovation in production, we have been able to garner a huge clientèle for ourselves. Moreover, we facilitate our esteemed customers with easy payment modes such as cash, cheque, credit card, demand draft, online and pay order. Apart from this, we deliver our final consignments via cargo, sea and roads. Apart from this, our R&D unit ensures that the manufacturing team gets sufficient information and the latest ideas to enhance the quality of products. In addition to this, our research associates conduct several market surveys, which help them to competitively price the products in both national and international markets.